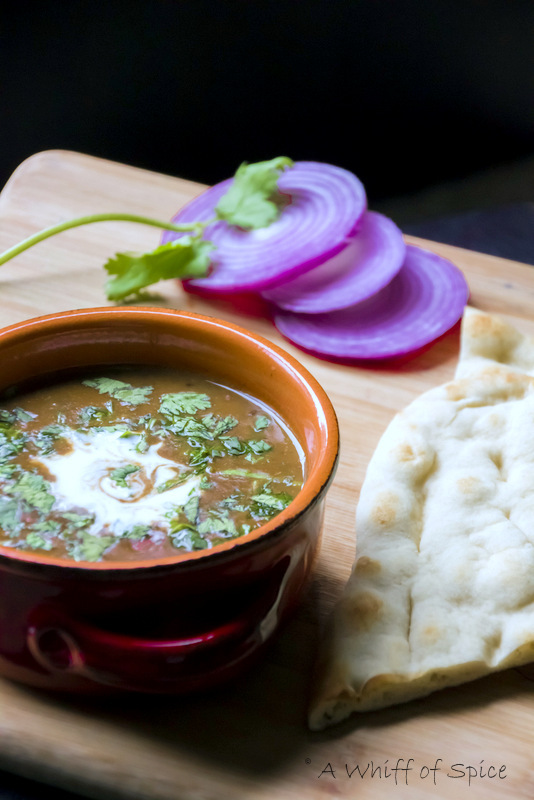 Dal Makhani - the diet version. This was supposed to be my very first post on the blog! And I have no idea why it took me almost 4 years to post it. I have made this countless time. Just for the three of us. And for our guests too. This was the very first low calorie 'restaurant style' dish that I learnt. I still don't believe that I actually paid for the recipe! I am talking about the early 2000s... much... much before blogosphere happened. Those were the times you had to a 'paid member' on cookery sites, to access their recipes. Oh! How have time changed! This recipe comes from Tarla Dalal. One of my favorite Indian chefs. More than her recipes, it was her zeal and enthusiasm that mesmerized me. Her cooking show were filled with laughter, tips and loads of love. She was a true foodie and her passion reflected in the ways she spoke and cooked. Without having any formal education on the subject, she turned her passion into a flourishing business. She passed on 2 years ago. But her legacy remains. In 2001, when my pancreatitis relapsed for the third time, I knew I was dealing with a chronic situation here. I had to be watch what I eat. I had to make lifestyle changes. Of course, there was meltdown, followed by depression. I was just 21 then. But I recovered. I mean from the depression. Pancreatitis is still very much a part of my life. I don't remember how much I paid, but signing up on Tarla Dalal's Healthy recipes, was one of the tastiest decision I made. Till recently, I have followed this recipe to the 'T', cooking my dal, adding milk and then tempering and slow cooking till the flavors amalgamated. But ever since, I learnt to cook one pot Rajma thanks to Sharmils's Satwik Rajma, I have started applying the same principle to the Dal Makhani too. 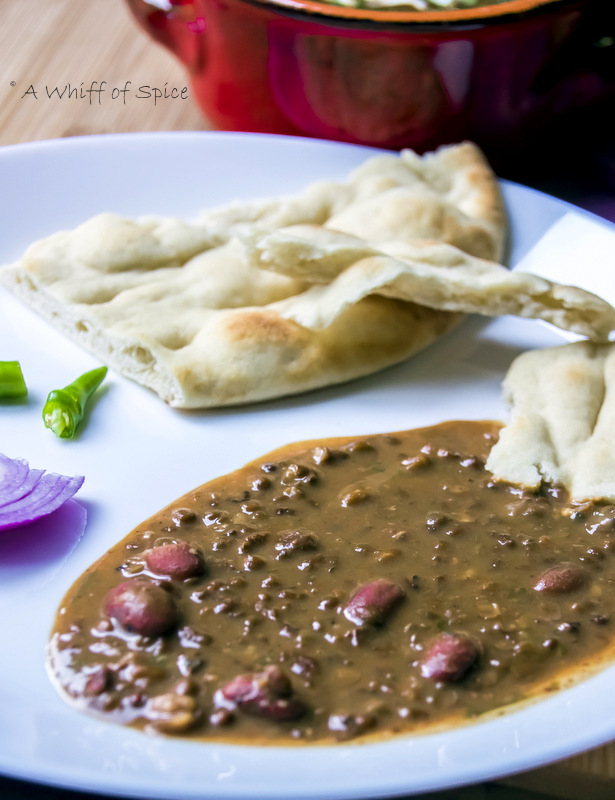 Dal Makhni is a north Indian dish where Whole Black Lentils (called Sabooth Urad Dal in Hindi) along with a handful of Red Kidney Beans (Rajma), are slowly simmered for hours in a rich, aromatic buttery gravy. Rich, decadent, delectable are few adjective commonly used to describe this creamy goodness, which is also my favorite item to order in a restaurant. 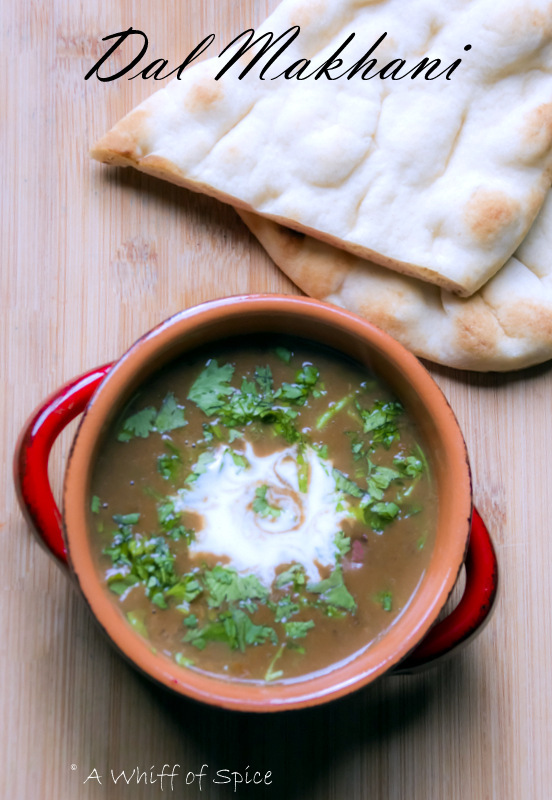 Despite the fact that the Black lentils are chock full of nutrients, Dal Makhni had a bad rap because of the amount of butter and cream used. But Madam Dalal had perfected the recipe using just 1 teaspoon of oil. The same creamy goodness- fraction of calorie. And I have even simplified the process, using just 1 pot - the quintessential pressure cooker. Instead of pressure cooking the dal and then tempering with the tomato based masala, I cook the masala in the pressure cooker and then add the soaked lentils. Then I pressure cook the lentil till they are super soft and mushy. The lentils cooks in the masala and becomes insanely flavorful. After the pressure is released, I add a cup of low fat milk and let it simmer for 10 more minutes. The creamy concoction is ready to be devoured with a bowl of fragrant Basmati rice or a pillow(y) soft Naan. To be true to its name (Dal = lentils; Makhani = butter based), I add a dab of butter as a finishing touch. But it is purely optional. We love.. love... love our Dal Makhni. It is a features very frequently at our Veggie Wednesday table. 1. 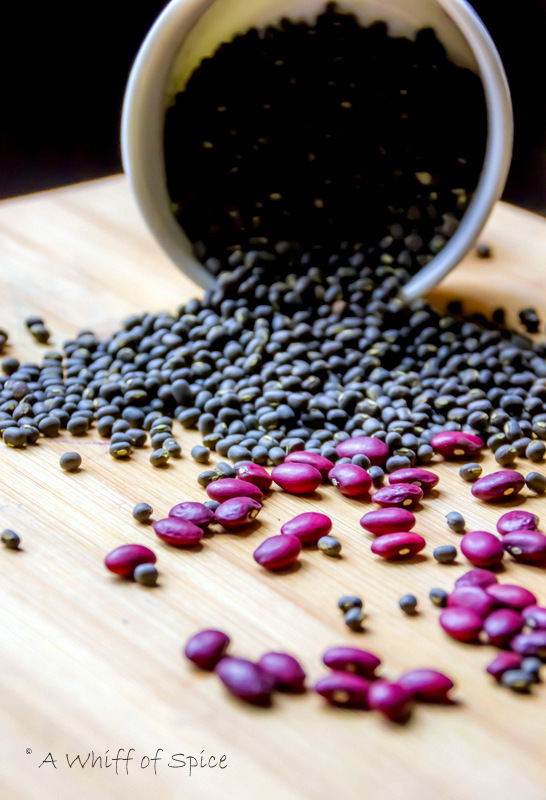 Wash the dry lentils and the kidney beans together and soak them in plenty of water overnight or at least 6 hours. In a pinch, soak them in hot water for at least 2 hours or till then plump up. 2. Once the lentils and the kidney beans have plumped up and are double the size, drain the water, give it another good rinse and keep aside. 3. In a pressure cooker, heat 1 tablespoon of oil over medium heat. Add the bay leave and the cumin seeds. 4. Once the cumin seeds crackle, add the chopped onions and the ginger garlic paste and saute till the onions are lightly golden and raw smell of the ginger garlic is gone. About 2 minutes. 5. Add the dry spices - coriander powder, turmeric, red chili powder (or paprika, if you like it mild) and salt. Add a splash of water, so that the masala doesn't burn and cook till the raw smell is gone. About 1 minute. 6. Now add the tomato pulp (grated tomato) and let it cook for couple more minutes, stirring frequently, so that it doesn't stick at the bottom. 7. Now add the soaked and rinsed black lentils and the kidney beans and mix it well with the masala. 8. Add about 4 cups of water, close the lid and pressure cook over medium-low heat for 45 minutes or 6 to 7 whistles. The target is to cook the lentils till they are super tender and almost mushy. The black lentils are pretty starchy and cooking them for this long results in a creamy gravy. 9. Once the pressure is released, add a cup of milk and let it simmer on low heat for another 10 minutes. Do a taste check and add salt if required. 10. Garnish with chopped coriander leaves and a dab of butter (optional). Serve with bread of choice. We usually eat it with homemade Roti or store bought Naan. 3. In wok/pan or Dutch Oven, heat 1 tablespoon of oil over medium heat. Add the bay leave and the cumin seeds. 8. Now dump the entire mix in a slow cooker. Add water and cook on low setting for 8 hours (5 hours on high). 9. At the last hour add a cup of milk. Once done check for seasonings and add accordingly. 10. Remove from the cooker into a serving bowl and garnish with chopped coriander leaves and a dab of butter (optional). Serve with bread of choice. We usually eat it with homemade Roti or store bought Naan. Dal Makhani, though insanely delicious has a bad rap due to the obnoxious quantity of butter and cream used. However, this version uses low fat milk instead of cream and very little oil, yet it tastes surprisingly rich and creamy, thanks to the intrinsic starchy nature of the Black Lentils. These tiny lentils are a storehouse of nutrients. It is rich in potassium, phosphorus and calcium. It also has a small amount of iron in it. It is also rich in vitamin A, B1 and B3, and has a small amount of thiamine, riboflavin, niacin and vitamin C contained in it. Whole Black Lentils is highly beneficial in controlling or curing ailments like diabetes, sexual dysfunction, nervous disorders, hair disorders, digestive system disorders and rheumatic afflictions.